Click to enlarge via Flickr. 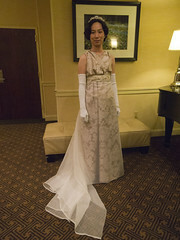 Left: front view at Dress U 2012. 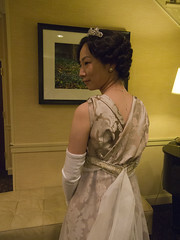 Right: back view at Dress U 2012. Click to enlarge via Flickr. 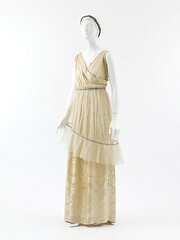 Evening dress by Paul Poiret. Notes: Made spring 2012. This dress fought me a lot. A LOT. I had no idea what I was doing, this being my first try at 1910s fashion, and the fabric shreds very easily. In the end I just made something up and winged it. The result was okay, but it’s never going to be my favorite. It got me through the event, though!